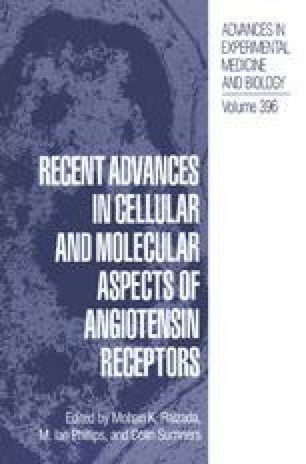 Circulating angiotensin II (Ang II) maintains fluid balance and blood pressure by actions on the renal, endocrine, cardiovascular and peripheral autonomic nervous systems. Ang II also acts in the brain to augment its peripheral actions by stimulating salt appetite and drinking, elevating blood pressure, and by modulating the release of pituitary hormones. Blood borne Ang II can access the brain via the circumventricular organs which have a permeable blood brain barrier. The central actions of Ang II in other brain regions beyond the blood brain barrier are probably mediated by Ang II synthesized within the brain (1,2).